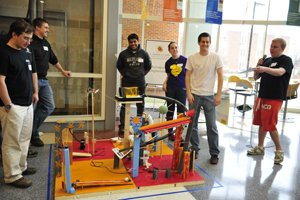 In a first-of-its-kind competition at the Clark School, teams representing each department competed against each other for the Clark School Alumni Cup on February 24 as part of National Engineers Week. The final standings put aerospace engineering in first place, civil and environmental engineering in second and materials science and engineering in third place. The goal for each team was to create a Rube Goldberg-inspired device that inflated and popped a balloon. Each team had to incorporate some aspect of its discipline in its device. Bioengineering featured animal power in their creation; aerospace engineering's contraption included a flying space monkey and textbooks by Professor Emeritus John Anderson; chemical and biomolecular engineering incorporated phase-changing fluid into its device; materials science and engineering incorporated magnetic fields in their set-up; civil and environmental engineering included the concepts of water management, transportation and construction in its elaborate setup; mechanical engineering made use of fluid dynamics to fill its balloon; electrical and computer engineering activated its device by placing a cell phone call. Students had one week to fabricate their devices and many stayed up three nights in a row to complete the projects. During the competition, each team had three chances to run their devices. Aerospace engineering ran its device successfully on all three attempts. School spirit was another factor on which teams were judged and civil engineering seemed to win in this category with many students wearing hard hats, chanting and painting their chests to show their pride. Materials science and engineering students donned cleanroom suits. The teams were judged by a group consisting of Associate Dean Bill Fourney, Alumni Director Josey Simpson, and alumni Doyin Adewodu (M.S. '10, electrical engineering) and Greg Wollard (B.S. '89), engineering alumni chapter president. The winning aerospace engineering team will be memorialized on the Alumni Cup trophy to be displayed for the next 12 months in the west lobby of Glenn L. Martin Hall. Each member of the team also received a medallion. "The Clark School Alumni Chapter exhibited strong commitment to students in managing and providing funding for the competition, in particular Kevin Schoonover, B.S. '06, aerospace engineering, and Liz Goldwasser, B.S. '03, mechanical engineering, who devised the idea," said Clark School Dean Darryll Pines.